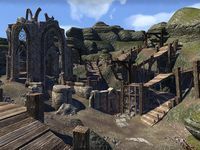 Bonesnap Ruins is a ruin about halfway between Koeglin Village and Wayrest in Stormhaven. It is occupied by the Bonesnap goblin tribe. 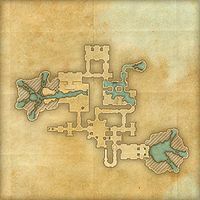 Bonesnap Ruins Objective: Stop the Goblin tribe in Bonesnap Ruins. 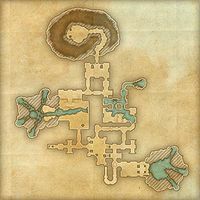 Bonesnap Ruins Wayshrine ( Leveled XP) is located just northwest of the ruins. Bonesnap Ruins Group Event 50 Slay the Eternal One in the Bonesnap Ruins. 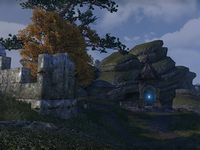 Even though the loading screen states that the Ayleid name of the ruin has been long forgotten, it is actually mentioned in the book The Mysteries of Moravagarlis. 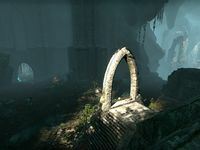 Books that can be found in the ruins include; Bonesnap Journal, Gaston's Instructions and A Distracted Enemy. A map of every champion necessary for the Bonesnap Ruins Conqueror achievement, plus the Eternal One in the north. This page was last modified on 12 April 2019, at 11:51.